‘rare’ pro-pakatan rally in penang – welcome! whoa! yes, for the first time, a rally by PR at komtar. thus malaysiakini is right to label it as 'rare'. all the while, almost every friday, we always hear of perkasa. 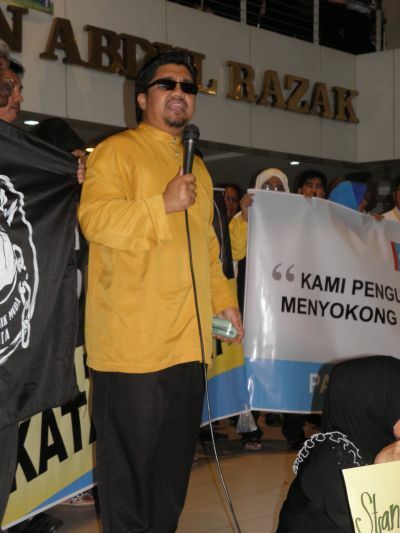 mamak (some) or some 'umno-based' malay NGOs having their rally their…. well it's not only anti state govt rally but anti lim guan eng! yes most of the time the rally is very anti lim guan eng, i tell you. oh and they not only held the rally there but they made a short walk e.g. from the nearby surau to komtar, whereas the PR supporters yesterday did not organised the walk but just gathered at komtar for the rally. well, perkasa, mamak (some), anti state govt NGO… they can hold a walk as the police will do anything to them… whereas if it is like yesterday's organiser e.g. PKR, SAMM, if they hold a walk, the police might stop them! yes, since yesterday's rally was 'rare' in that it was a PR rally, i sure won't missed it, so i especially took leave to attend it! yep, true. went there at about 2.15, met susan loone. there were not too may people there… i guess because of the low publicity. never mind, as long as the message got through. well, read about it in malaysiakini, written by susan loone. i copy and paste it here for those who are not malaysiakini subscribers (remember if you want to sign up, do contact me, as i can offer discount). oh ya, i only put up two photos here, taken by myself. for the rest of the photos, please visit my facebook photo album. Komtar, which is increasingly known as a democracy square due to the many rallies held by anti-Pakatan forces since 2008, witnessed one of its rare moments when a demonstration was held in support of the state government today. 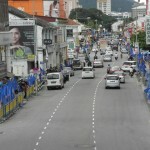 Initially, around 50 people had turned up for the rally, carrying pro-Pakatan banners to express their desire for the coalition to be maintained in Penang. Later, the crowd swelled up to about 100 and turned into a mini ceramah by about seven speakers, mostly from the state PKR Youth wing and Solidariti Anak Muda Malaysia (SAMM). Some of the banners spotted at the rally had slogans like, "Stand together (with) PKR, DAP and PAS", “Pakatan Rakyat must be given the mandate again" and "I love Pakatan Rakyat". SAMM chief Badrul Hisham Shaharin (left) told the crowd – which were made up of mostly reporters and onlookers – that they must support a multi-racial Malaysia, with the Malay community at its base. "If we can have a Malay base, but ensure the rights of other communities in our country, we will be more respected," he said. Then, he told MCA and Gerakan – the two Chinese majority parties in the BN – to listen up. "Malaysians must reject racist parties. For example, if anyone ask you to balik Kerala, tell them that nobody knows you there as you were born here," said the leader, who is popularly known as Chegubard. "We'll just allow one person to go back to Kerala, and that is (former prime minister Dr) Mahathir (Mohamad)," he quipped. He praised the Penang government as well for allowing freedom of speech to flourish, what with the many demonstrations held at Komtar by groups such as Perkasa. In their brief political talks, the speakers condemned Umno and BN for all the ills of the country, including the marginalisation of the Malays. Many of the rally participants wore yellow T-shirts and were seen clapping and cheering at the many anti-BN anecdotes shared by various speakers. Three police trucks were stationed nearby, but had not intervened in the event. During the session, however, many were also seen rubbing their eyes, coughing and covering their mouths due to pepper spray that had been used by several unidentified individuals. Among the speakers at the rally include state PKR Youth chief Amir Ghazali, PKR Bayan Baru Wanita chief Latifah Hussainsa and anti-toll NGO dubbed 'Hapus' activist Zainulfaqar Yaacob. 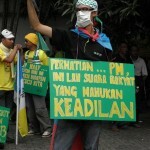 KL112 people’s uprising rally – i was there! 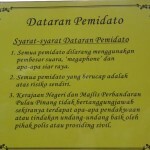 penang – rule by PR or by the police?